Who invented the rigid airship? Did people really think they were safe for passenger travel? By the turn of the century, Count Ferdinand von Zeppelin had a dream. Before the Wright Brothers flew at Kitty Hawk, Zeppelin wanted to build a great airship that would rise and stay aloft because it was filled with lighter-than-air gas. With the help of Theodor Kober, Count Zeppelin carried on at Friedrichshafen (in the southern part of Germany) despite enormous criticism. Many folks thought he was crazy. By the summer of 1900, however, the first rigid air ship (LZ 1) was ready for a test flight. To help maneuver his monstrous creation, Count Zeppelin ordered his crew to prepare a floating hanger on Lake Constance (also known as the Bodensee). On July 2, 1900 the airship lifted from its moorings and stayed aloft 18 minutes. Even sceptics could imagine its potential commercial and military value. 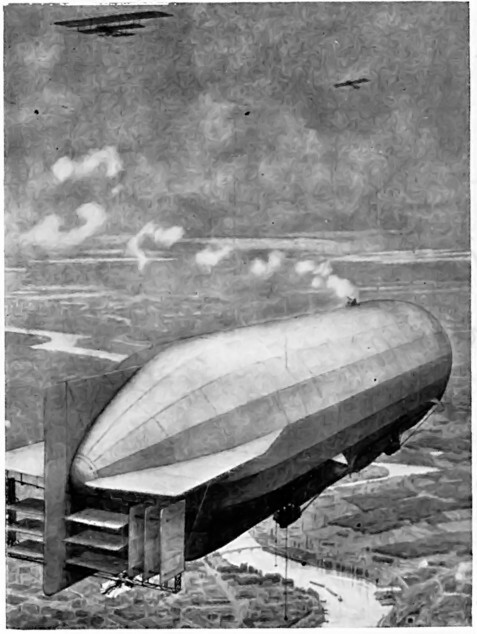 By World War I, both Germany and England used rigid airships in their military efforts. Count Zeppelin, who lived long enough to see dirigibles mass-produced, died on March 8, 1917. He never knew the Treaty of Versailles would temporarily halt Germany’s production of "his" airships. Bos, Carole "THE GREAT ZEPPELINS" AwesomeStories.com. Apr 01, 2007. Apr 23, 2019.